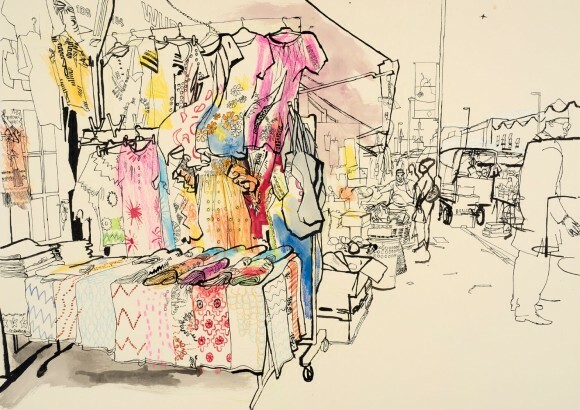 In the third of this series, Contributing Artist Lucinda Rogers & I visit Ridley Rd Market in Dalston to meet more of the traders featured in her current exhibition On Gentrification – Drawings of Ridley Rd Market at House of Illustration in Kings Cross. 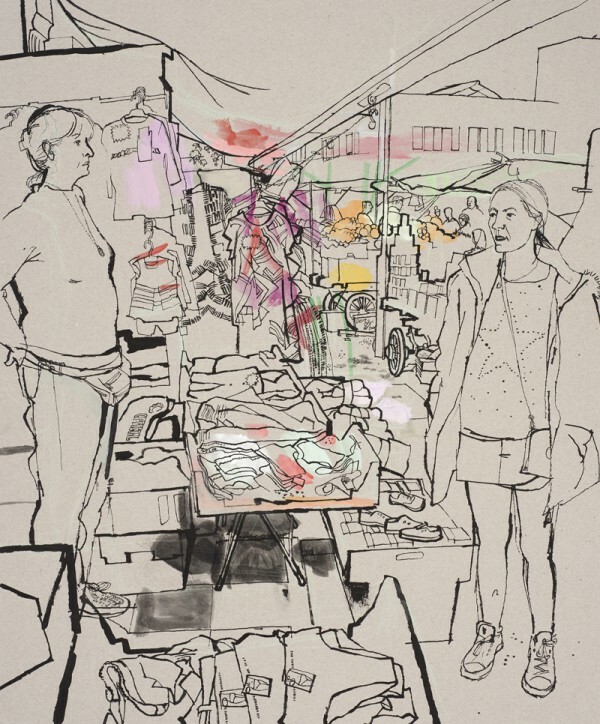 Lucinda is discussing her work at the gallery on Thursday 1st February at 7pm. Click here for tickets. American illustration, Bob Peak? 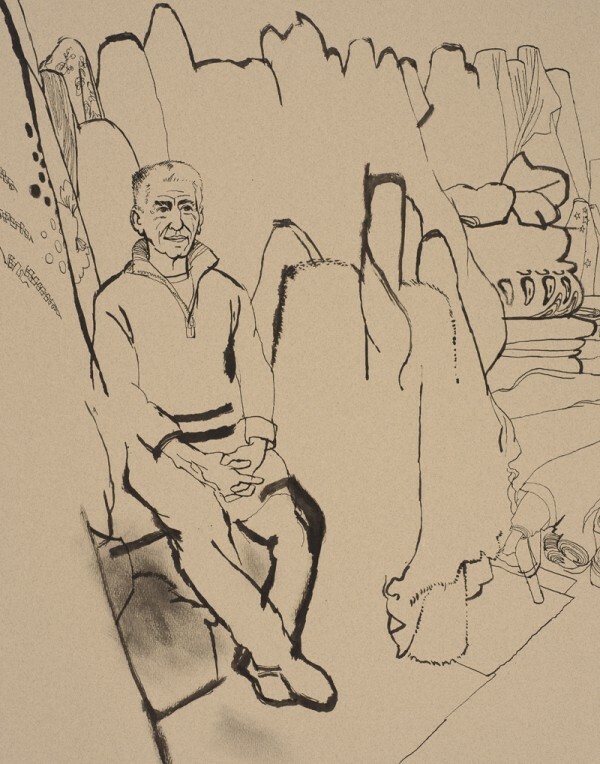 When he was not doing his highly-celebrated commercial work, his personal sketches had a kindred feel to this series; and he enjoyed including bits of lettering. I am wowed by her ability to capture an image, a mood, a scene…….with her lavish line. I was born and brought up in Stoke Newington. We lived in a house on Clonbrock Road. 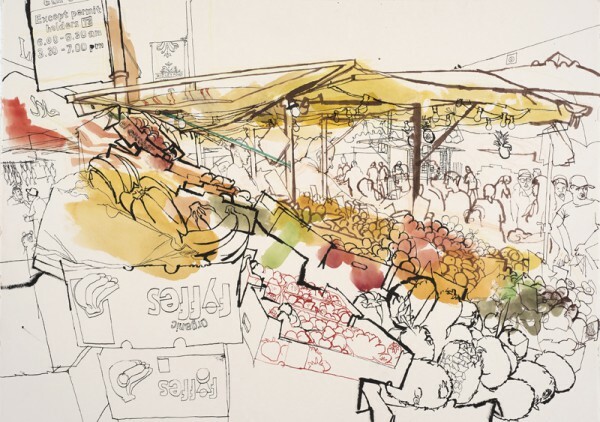 I visited Ridley Road market often and marveled at the towering fruit stalls and all the costermongers calling out. I used to go with my family to the Eel and Pie shop across the street and I remember being hoisted up to look at the eels slithering around in their containers. and my Dad and I went to The Waste too to look at odds and ends—just the two of us, it was so special. There was also Chapel Street market in Islington and I remember the smell and taste of apple fritters and the man who took pictures—I still have the photo of me holding a woolly monkey (must have been the organ grinders) I look ecstatically happy! It was working class and grimey and I loved it all. Now I live in Chicago, going on 40 years, but I remember a time in my old neighbourhood that is long gone with great fondness. Thanks for bringing it back to me.